Step 2 – Read all of the information on the careers page. Then, scroll down to the bottom of the page. Step 3 – Decide if you are applying to retail or the home office. We are going to walk through the application process to apply to retail. Applying for the home office is a similar process. Step 4 – Click on Apply to Retail. Step 5 – Scroll all the way to the bottom of the page. You can now use the search bar to search for open positions. You can also use the category and location boxes to filter the job openings. If you click on view all open job positions, you can see all positions available and decide which one you would like to apply for. Step 6 – Use the location box to filter the results to show you only the positions available in the area where you will be applying. Step 7 – Click Search. 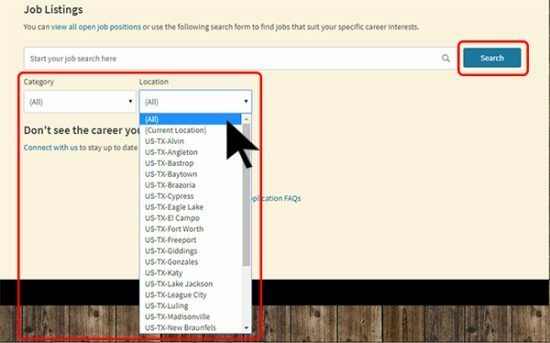 Step 8 – Find an available job opening from the list of results and click on it for more information. If there are no results, or your initial search criteria does not return any promising opportunities, try searching with different criteria from the search bar at the top of the screen. There is a description of the position on the left of the screen. Read this carefully and decide if the position you have selected is an appropriate fit for you. Step 9 -Click Apply for this job online. Step 10 – Enter your email and click next. You should now see the message in the screen grab below. 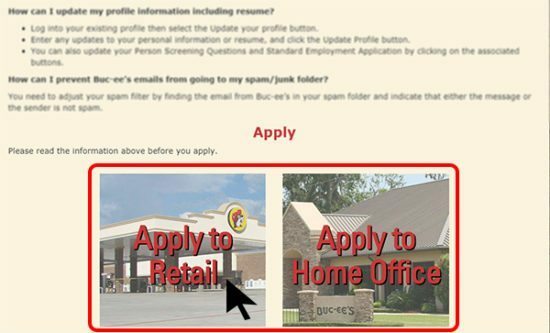 Step 11 – Log into your email, find the email from Buc-ee’s, and click on the link in the email to verify your address. Step 12 – Enter the required information to complete your Candidate Profile. Upload your resume if you have one. If you need help creating a resume, we have a sample resume outline at the bottom of the homepage for this site. Step 14 – Confirm you have completed all required sections of the application and submit it when done.